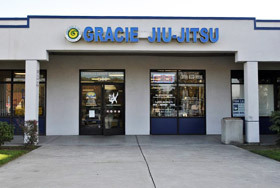 operated and supervised by a Gracie family member. * Open Mat: Open to all student members. Practice at your own pace with other students. Not a formal class. **NO-GI Class: Is the application of competitive Jiu-Jitsu techniques without use of the Uniform. 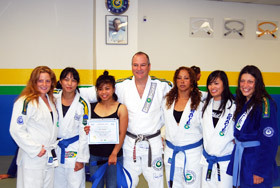 Self-Defense Training: Taught during the regular Jiu-Jitsu Classes. Enhance your overall Street Self-Defense skills. * KIDS FRIDAY NIGHT CLASS: 5:00pm - 5:50pm - NO-GI Class: Is the application of competitive Jiu-Jitsu techiniques without use of the uniform (GI). "Open to ALL age group"
To attend a free introductory class, you can simply call us or stop by to schedule an appointment. 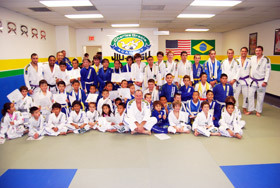 Or you can email us at introclass@charlesgracie.com. Please write: “INTRO CLASS - TRACY LOCATION” at the beginning of your email with a contact number, followed by the date and time you would like to attend. The intro class is a one-time 30 min class outlining the basics Brazilian Jiu-Jitsu techniques. This class serves as a preparatory class to those interested in seriously enrolling at the Academy and training at least twice a week. Our introductory classes are offered everyday to fit the busiest of schedules. All new students must undergo an evaluation by an instructor (intro class) whom will make recommendations to which program the student should enter. Private classes are a great way to improve your Jiu Jitsu game. If you are having difficulty grasping certain technique or need to work on a certain aspect of your game, private lessons give you the opportunity to take your game to the next level. During your private classes you will receive 1 on 1 instruction - All of the attention is focused on you without the distraction of a group class. Technical Analysis - The instructor will analyze the way you perform techniques, point out any flaws and show you how to fix them. Customized Techniques - You will learn setups, defenses and attacks designed to fit your body type and grappling. Semi-Private Class minimun of 2 and maximum of 4 people. For classes’ descriptions and prices information, please visit our school and speak with one of our program directors in person. Jiu-Jitsu for Strength, Confidence and Safety!